It's time for our freebie mail call to show you what freebies came in the mail! We are waiting on tons of stuff to arrive including a Promo box with some treats and prizes for you guys too! So check back for that to arrive. Make sure to check out the top freebies you can order right to your home today. One of the products we got in the mail today is on that list. Let's get to what was in the mail today! Our Natural Calm samples arrived. This is one free sample offer that comes around quite often. It is currently over but if you check this page every so often you will find that the free sample offer is live again. My favorite so far was the raspberry-lemon flavor for sure. And they do have a calming effect for sure. Next was an free Epipen Starter Kit . This offer is still available if you know someone who could use this offer. There are different types you can request to fit your specific needs. Takes about 2 weeks to show up in your mailbox. And the best for last was a cheque from Legerweb for completing maybe 4 surveys. This is my favorite way to earn side money. They are the cream of the crop when it comes to earning money for answering surveys. This $20 check is going into the free TV pot. You can read about the free Samsung TV we are using online earnings from Swagbucks and Legerweb and a few more ways thrown in there too. 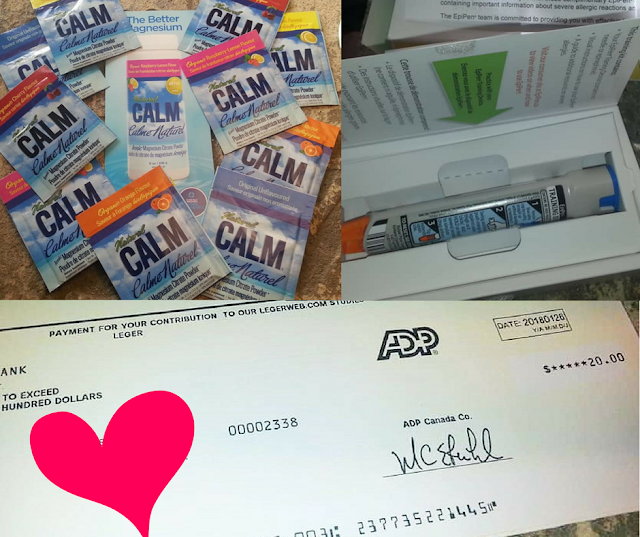 What awesome freebies have arrived in your mailbox lately? Tell us in the comments.